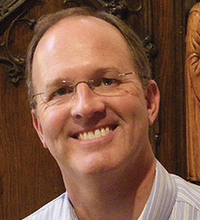 Scott Herr graduated from Lewis and Clark College and received his MDiv degree from Princeton Seminary in 1987. After his ordination, he served the Union Evangelical Church in Mexico City, Mexico, until 1993. He was called to serve the International Protestant Church of Zurich, Switzerland, for six years and then served the First Presbyterian Church of Fort Collins, Colorado, for nine years during which he received his DMin degree from Fuller Theological Seminary. He has served on the pastoral team of the American Church in Paris, France, since 2008.